The Romans would sow the earth with salt, America sends its terrorist proxies in with chisels and jackhammers. July 18, 2015 (Maram Susli - NEO) - In what UNESCO is calling ‘Cultural Cleansing’, the Islamic State in Iraq and Syria (ISIS) have begun destroying 2000 year old Syrian statues in the ancient city of Palmyra and are claiming to have rigged the ancient ruins with explosives. This follows the systematic destruction of historical sites across the Middle East. So far ISIS has destroyed several sites across Iraq, which includes the destruction and looting of Mosul Museum, the destruction of the 3000 year old Assyrian city of Nimrud and the bulldozing of the 2000 year old fortress city of Hatra. Recently ISIS militants threatened to destroy Egypt’s Sphinx and pyramids. While the world watches ISIS terrorists destroy the relics of the very birth place of civilization, we must reflect upon the reason why this is happening and how we have reached this point. These crimes against history are portrayed in the mainstream media as nothing more than the result of mindless destruction by ISIS barbarians. However it is in fact part of a US Government plan to balkanise the Syrian and Iraqi nation-states, and by attacking the heart of their nationalist identity, their history. Systematic destruction of both Islamic and Non-Islamic sites. ISIS’s take over of historical sites are not incidental, they expend military resources to target these sites. ISIS attacked Palmyra in spite of the fact it would have been more militarily strategic to focus on attacking the Syrian city of Deir Ezzor. The purpose of the focus on destroying historical sites partly stems from ISIS’s adherence to Wahhabi doctrine which is a Puritan interpretation of Islam. Islam forbids idolatry and in the mind set of Wahhabi extremism this translates to ‘all statues are forbidden’. This is how ISIS justifies the destruction of ancient statues, in spite of the fact no one worshiped those statues. The destruction of ancient tombs can also be explained by Wahhabi doctrine which is hostile to burial sites for fear they may become a site for veneration or worship. But even Wahhabism does not explain the destruction of walls in ancient cities. It is argued that ISIS is destroying non-Islamic sites, to bury any history of pre-Islamic civilisation. It coincides with what has been the gradual ethnic cleansing of Middle East Christians over the last two decades. The Patriarch of Syriac Catholic church in Iraq, Ignatius Joseph III Yonan, described the destruction of Christian sites in Iraq as a conspiracy which the West is complicit. He told the Guardian that he believed it was part of a “Machiavellian strategy” by the West to evict Christians from their ancestral homes across the Middle East. However, ISIS has also destroyed mosques and Islamic historical sites, revered by both the Shi’ite and Sunni sects. They have even threatened to destroy Mecca, the holiest site in Islam. The Saudi Arabian monarchy share the same Wahhabi ideology as ISIS, and they have been demolishing Saudi Arabian Islamic historical sites to make way for hotels and shopping centres. This has been on going since 1985 but the rate has recently increased in conjunction with the growth of ISIS. The Saudi regime has also destroyed UNESCO heritage listed buildings in the old town of Sanaa,Yemen, through a targeted air strike on the old town of Sanaa. This attack, like the ISIS attacks on old city buildings, cannot be explained by Wahhabism alone. But far from what are seemingly random acts of violence, there is an agenda behind the destruction but it belongs to the United Sates not ISIS. The Cultural cleansing is a direct result of US foreign policy in the middle east and has been going on for decades. ISIS was borne in 2006 as a result of the US invasion of Iraq. In 2011 the US destabilised Syria by backing the Muslim Brotherhood linked insurrection, creating the fertile ground for the growth and empowerment of ISIS. But the systematic destruction of middle eastern artifacts was happening before ISIS even existed. In Syria, the US backed Free Syrian Army (FSA) were digging up archaeological sites and selling artefacts for weapons. This has been happening since at least 2012, well before ISIS was a presence in the Syria. Fighters allied with the Free Syrian Army units battling the regime of Syrian President Bashar Assad have told him that they are developing an association of diggers dedicated to finding antiquities in order to fund the revolution. “The rebels need weapons, and antiquities are an easy way to buy them,” says Abu Khaled, who goes by his nickname in order to protect his identity. Furthermore, Jabhat Al Nusra (JAN), Al Qaeda’s Syrian wing, was busy wiping out historical sites well before ISIS became a significant presence in Syria. In May 2013, JAN bulldozed a mausoleum in the town of Ayn Al-Arous visited by pilgrims for the prophet Abraham, who supposedly spent some time with his wife Sarah in the town. This year JAN destroyed a 13th century mausoleum of leading Islamic scholar, Imam Nawawi, in Dera’a province. The Al Qaeda linked JAN follows the same puritanical Wahhabi Islam as ISIS and Saudi Arabia, but they have not received the same coverage as ISIS in the mainstream media. Instead the Qatari interest groups, think tanks and the NATO media attempted to rebrand them as “moderate”. Going back even Further, In April 2003, only a few days into the US invasion of Iraq, Baghdad Museum was looted. Iraqi soldiers had been defending the museum against an attack by the US military, but were forced to retreat. US forces were accused of being responsible for the looting, but denied the allegations. However there was evidence to suggest that the looting was pre-meditated as thousands of valuables were stolen from locked concealed store rooms. 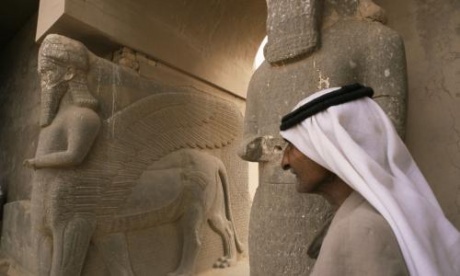 Regardless the US illegally obtained and kept thousands of Iraq’s cultural treasures. “The Iraqi government was trying to get them back but the American Administration wanted to strike a deal and return only half of the documents,” he explained. Many of the looted artefacts ended up in New York, London and Israel. In 2008 Baghdad officials charged Christie’s auction house in New York, with trying to sell looted artefacts. Looted Iraqi artifacts found in London included a guardian angel statues from the ancient Assyrian city of Nimrud, a city that has been recently attacked by ISIS. Babylonian Torah Scrolls were smuggled into Israel with the help of the US military contracted mercenaries,. Israel refuses to return the scrolls to Iraq. Syria is already repeating the same tragedy as Iraq, in a new brazen method of black market advertising Facebook pages selling precious Syrian antiquities have emerged . Chinese news paper Xinhaunet reported that Syrian antiquities were already turning up in Israel, brought in by smugglers who received them through trade with the FSA. If we continue to go back in time even further pre-ISIS, US destabilisation of Afghanistan in the 80s resulted in the empowerment of the Taliban and the birth of Al Qaeda. In 2001 the Taliban destroyed 1700 year old Buddha statues with dynamite. In all cases it was the intervention of the US and its allies that resulted in the destruction and theft of Middle Eastern history. The destruction was caused either directly by the actions of occupation forces or indirectly through the backing of extremist groups. The destruction of Antiquities has been to systematic and purposeful to pretend it was simple the result of a foreign policy mistakes. The destruction antiquities during invasions and occupation has been common occurrence through out history and is a way for the invading forces to loot a countries resources and demoralize the spirit of nationalism which may unify a country against the invader. The Roman Empire applied the concept “Damnatio memoriae” (to remove from memory) to those it believed were its greatest enemies. The Romans advocated this against the city of Carthage and “sowed its the ground with salt” to prevent its inhabitants from prospering again. The Nazi plundering of cultural property from the territories it occupied is well documented. Britain, France and Germany also plundered the artefacts of Middle Eastern colonies after the first world war. Many Syrian and Egyptian artefacts remain at the Louvre Museum in Paris. In 2002, on year before the invasion, the Iraqi government appealed to Berlin for the return of the Babylon Gate. The U.S. seems to have adopted the concept of “Damnation Memoria” against Iraq, Syria and perhaps the wider middle east. 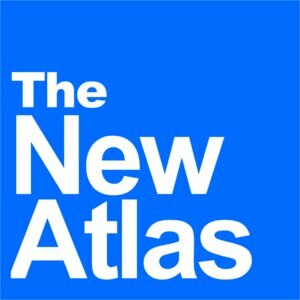 The plan to balkanise and redraw the Middle East was laid out by former U.S. Secretary of State Condoleezza Rice in 2006 called “The Project For a New middle East”. The US’s policies during the Iraq war, such as the use of death squads and the introduction of federalism, were designed to cause sectarian divisions. Even as early as 2007, think tanks such as the Brookings Institute were suggesting the ‘soft partition of Iraq’. In 2013, at the University of Michigan, Henry Kissinger stated that he would prefer to see the partition of Iraq and Syria. The strategy is becoming more and more openly discussed not only amongst think tanks but in the media. The neocolonialist powers in the United states have exploited Wahhabism to pave the way towards balkanisation. Saudi Arabia, ISIS, Al Qaeda and the Taliban have all been useful to this end. In the book Confessions of a British Spy and British Enmity Towards Islam it is claimed that Britain founded Wahhabism in order to weaken the ottoman empire. Whether or not the book’s claims are legitimate, it is clear that Wahhabism and specifically ISIS objectives fit seamless with the imperialist agenda of the United States. A declassified Defence Intelligence Agency document stated that creation of the Islamic State, would be useful in order to isolating Syria from Iraq and Iran. Dividing and conquering, these nations into sectarian based state lets in constant antagonism towards each other, will make them perpetually weak and unable to defend themselves. Israel has already set out its designs to claim the Golan heights as its own if Syria disintegrates. The balkanisation process is expedited by dismantling a nations Identity. 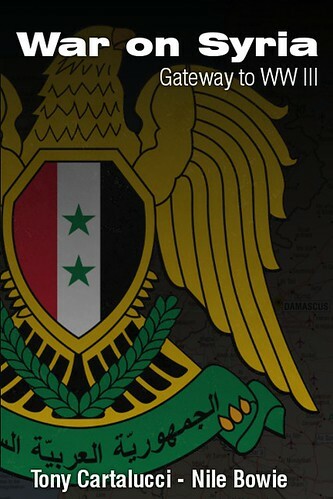 Syria and Iraq derive their national identity from there thousands of years of history. By destroying these ancient artifacts ISIS are wiping out any tangible evidence of Syrian and Iraqi ancient civilisations even existed. Looting these artifacts, and selling them to Europe and the US, also detaches these ancient civilisations from modern day Iraq and Syria. ISIS also useful in that it shares the US government’s disdain for middle eastern nationalism. They believe all loyalties should lie in religion rather than the nation state. British citizens of Pakistani origin who have joined ISIS are claiming Syria as land that belongs to them, though they have never stepped foot in Syria, simply because they perceive it to be a ‘Muslim country’. It is because of these powerful imperialist interests, that world stands by and watches as ISIS destroys the cradle of human civilisation. The so called ‘Anti-ISIS coalition’ spear headed by the US, is nothing more than window dressing and is never serious about defeating ISIS. They US doesn't just want to destroy Syria and Iraq, they want to wipe out any memory that these countries ever existed.